One of the most important tourist attractions in Rome is the ancient Roman Forum. Barely a visitor to the city of Popes and Caesars fails to visit this place with its important monuments. The Roman Forum was once the centre of the metropolis and beyond, to the extent that people at the time believed it was the centre of the world! This was symbolised by a stone image of a navel. In a sense this was true as the Roman Forum was actually the centre of the Roman Empire, as the majority of public life took place here. Goods were bought and sold, debates and policies were made and people simply strolled along or met up with friends and acquaintances - as is still the custom in Rome today. 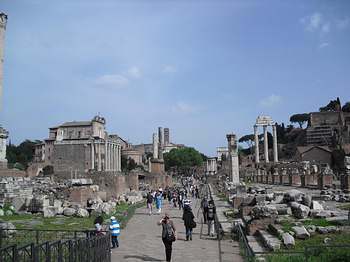 The Roman Forum however was much more than just a large public space in the centre of the city. Rather it was surrounded on all sides by magnificent secular and religious buildings – the earliest of which were already erected during the period of the Republic. Under the rule of the Caesars many reigning emperors put their ambition into expanding the Forum and to erect new magnificent buildings. After the fall of ancient Rome the Forum also fell into demise and was in later years even used as a quarry. Among other things, the world famous St Peter’s Basilica was partly built using the stone from the old Forum. Despite this many of the remaining ancient buildings have still been well preserved and enable visitors to go back 2000 years in time. 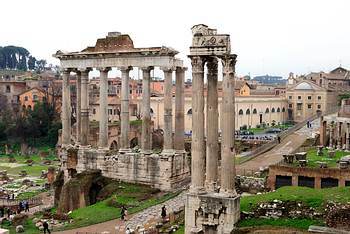 Some of the ancient ruins that can be visited are the Temple of Janus, the Temple of Romulus, the Temple of Vesta, the double Temple of Venus and Roma, the Curia, the former venue of the Roman Senate, the Arch of Titus and many other buildings. These remains give one a good idea of the former glory and splendour of ancient Rome. Entry to the Roman Forum is free. Tours take place daily around 10.30 with which one can participate for a small fee. The Roman Forum is open daily from 9am to 6pm and is easily accessible by public transport. With the metro one takes line ‘B’ to the Colosseo station and with the bus, one takes route 75 and alights at Foro Romano. For a good choice of hotels with discount prices, visit Rome Hotel for more information.